Glad I caught up with you guys. Just in case you’ll be stuck in our fair city (not necessarily a bad thing; chill chill in the house *hihi) and you’re looking for a new place to eat at for one of the days of the looong weekend, eatsplorer Xine is here with a feature on a newly opened resto. This rectangular pizza pie was pretty good. Not as good as the ones we get from the resto that shall not be named but still good. Chorizo and red egg, what a combo for toppings! ^^, It’s nice to get a bite of the parts where there’s some salted egg in it. Oh, mushy grainy, salty goodness. When the lamb plate arrived at the table, I observed that the meat had some kind of pulled pork quality to it. No bones, not even big chunks of the gamy but delicious meat, Race says. =) It was, however, a fantastic dish that he savored for it had a lot of sauce, so much so that he was left with lamb strips and no more rice at the end of the meal. X marks Ritz Legarda Restaurant for good food in Baguio. Yahooo!!! 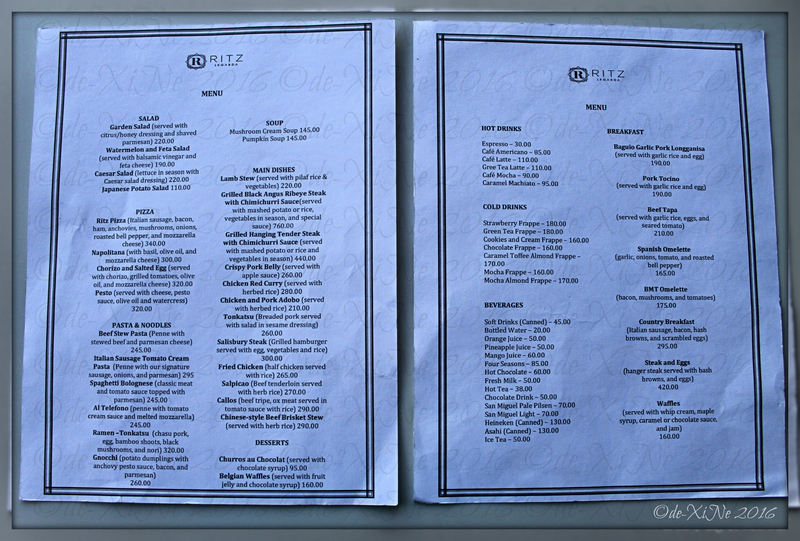 A new post on a new restaurant in Baguio. I was waiting for your latest feature. Hello there, Zara! I was thinking about taking this week as a vacay from posting but I remembered a long weekend is coming up, thus, this Ritz Legarda restaurant feature. You posted about RITZ. I was about to message you to please check them out. *hihi It seems weather weather for being first in the comments. Oh, yeah, from the entrance to the back where you can see Cafe Will from the balcony, that’s how long and wide the floor space is for Ritz Legarda’s dining area. There’s even like a sunroom looking part extending out to the parking space in front of the hotel.